Held in Salisbury, Maryland on April 15 – 17, 2011, it is the second largest KCBS sanctioned event in the country, and the largest on the East Coast. This year it was a success despite the weather. 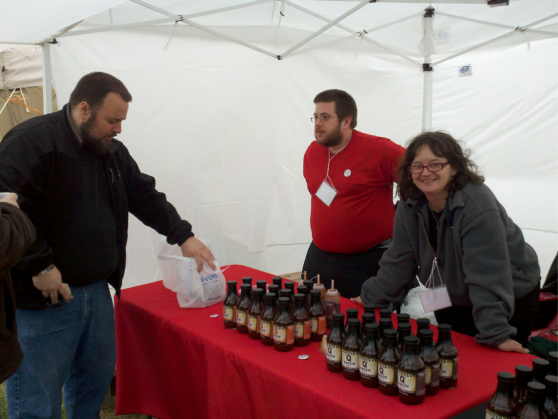 We arrived on Saturday April 16th on a windy, blustery, and very busy day in the competition area. Teams were running to get the pork turn-in done on time. For the first time in our 4 years attending, we were able to get into the judges tent for a few pictures. It was amazingly quiet. We got in just as they were beginning to judge the pork entries – the next-to-last turn in, to be followed by the brisket. After we took a few photos there we were off to meet some of the competitors. 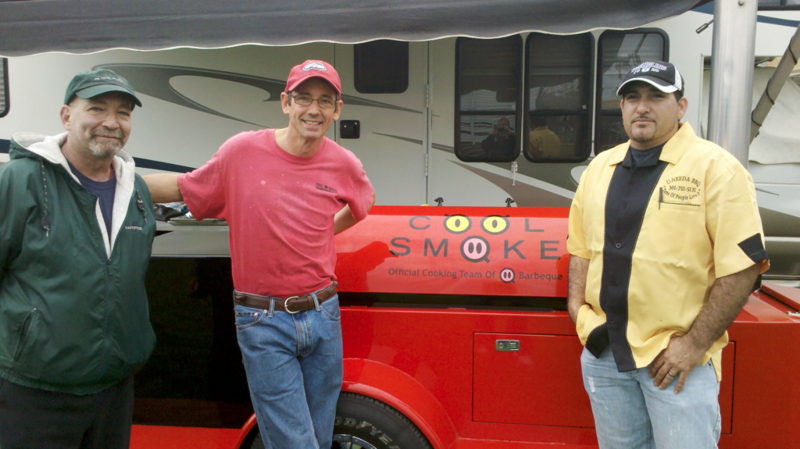 We had been following a few of our old friends and some new ones on Facebook, and were able to hook up with some of the big players in the BBQ competition world as well. Our first goal was to find our friends from Huck’s Hut, Bruce McCall (Huck, Jr.) and his father, Huck Sr. They were in the process of doing their last turn-in, brisket, as were many of the other teams. After getting a warm welcome from them, we were off to see who else was nearby. That’s when we ran into Tuffy Stone’s team, Cool Smoke. As Tuffy was away delivering his brisket, we were able to spend some time talking to his dad, George. What a great guy. He admitted that he didn’t really teach Tuffy everything he knew about competition BBQ, but was so proud of his son and all that he had accomplished. While we were there, Tuffy came back to his site after his last turn in. We were so impressed by how down-to-earth he was, and we spent a lot of time talking with him. He’s a great guy and gave some good ‘que tips to our friend, D.J Watkins. And of course, we got a pic with him. We were looking forward to seeing George Hensler from Who Are Those Guys, a BBQ superstar from Street MD and author of “Startin’ the Fire”. 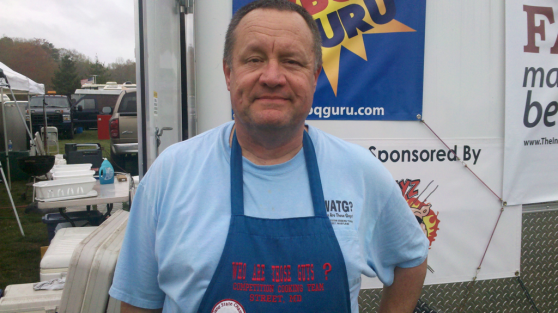 George was instrumental in helping the award-winning team from Florida, Whiskey Bent BBQ, get all the equipment they needed to compete in Salisbury for their first time. We also met Bob (BBQBandit from the BBQ Brethren) from PA, who brought a trailer down with his cooker so Chad from Whiskey Bent could participate, resulting in a 3rd place call for brisket. We talked to a ton of other competitors, including Lower Slower, Princess and the Pig, Myer’s Meats and Bob’s Hogs, and spent some time with the first competitors from outside the USA, Black Pig from London, Ontario, Canada. They had some really impressive cookware, including a ceramic oval Primo they got at the Jack Daniels comp, and a pellet grill we had not heard of – Louisiana Grill. They came away with 5th in Pork! We took a short stroll over to the “public” area, where the food vendors were and ran into our friend Todd Courtney of Todd’s Dirt. As usual, he was doing a brisk business selling his famous seasonings, Todd’s Dirt Original, Crabby, and Bayou. 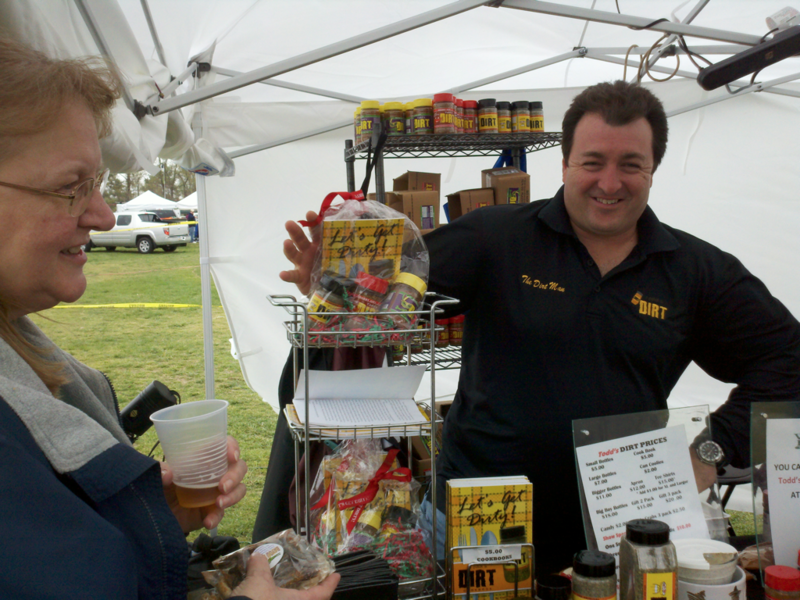 Todd also turned us on to a new venture of his, combining his seasonings with chocolate candies. More on that delicious combo to come! Next to Todd was Doomer’s “Q” Sauce – a Maryland style BBQ Sauce company, where we met owners Todd and Jo Dooms from Parkville, Maryland. It was their first big event and they were very well received. Sampling their Doomer’s “Q” Sauce Original, Dark, and Hot & Spicy bottles, folks were impressed and scooping them up by the three-somes. Jo also hooked us up with a bottle of their upcoming Mustard “Q” Sauce that we hope will take off. Stay tuned for full reviews on these great Maryland based BBQ sauce entries. Speaking of Maryland companies, right next to Doomer’s was Captain Thom’s, who had left for the day just before the entire event shut down at 6 pm due to lightning. Sorry we missed you Thom and Nancy! We’ll see you at Peppers at the Beach May 20th. We spent the last hour of our day helping Doomer’s Q and Todd’s Dirt secure their tents. The wind gusting through the grounds ripped a lot of tents from their moorings, and all-hands-on-deck were required to keep their exhibits from flying away. Fortunately, no product was lost, and Sunday turned out to be a gorgeous day so they could sell their products on a much sunnier day with record turnout crowds. 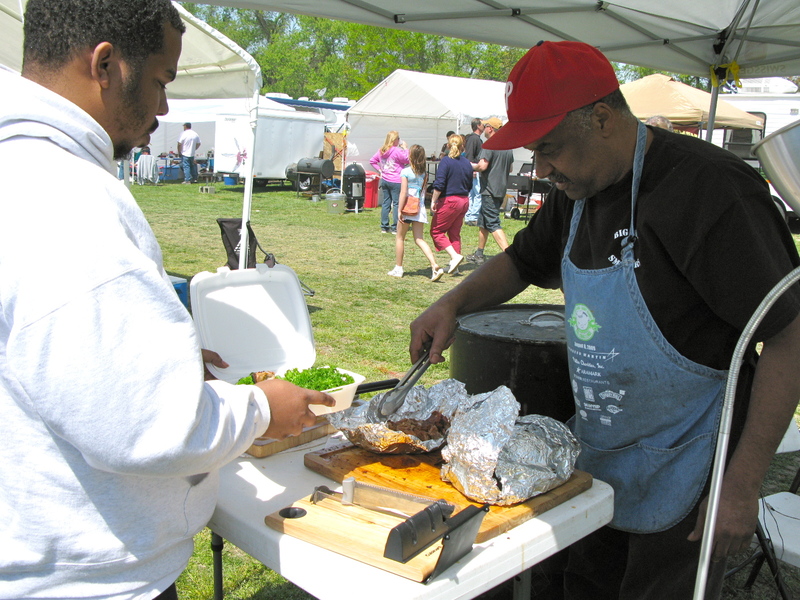 We had a great time and we hope to see you next year at Pork in the Park 2012! At KCBS Events, you normally don’t get to sample any foods. We are lucky to be able to “try” samples from some of the competitors as friends. Yummy! Brian, I’m envious! Knoxville isn’t having a KCBS event this year so I’m going to have to drive out to Sevierville or maybe the Jack.